In our Munanso, Nsunga is very Sacred! The Spirit of the Tabaquero is very strong within the Munanso. Like all Paleros we give copious amounts of Tobacco (Nsunga) the the Muertos!!!! We also utilize Nsunga in Ceremonial Drinks, smoke it directly in Ceremony, and utilize it in Bilongo, Bano, and in its multiple additional uses inside of our Munanso/ Bateys. The Tabaquero is not just a smoker, not all smokers are Tabaqueros! The Tabaquero has a Spirit that works directly with the Spirit of the Tabaco, a Spirit that can direct the Tabaco for healing or for harming, let us not be naive! Amazonia is full of Tabaqueros, and our Taino Ancestors continue to vibrate the Spirit of the Tabaquero very strongly. The pipes utilized vary widely from region to region. 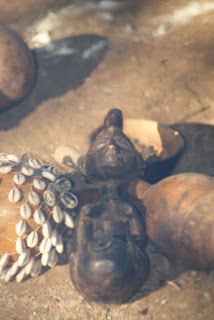 In our Munanso we have a variety of pipes from Africa to the Amazon, and one is carved into a female fertility form. The Tabaquero embraces the Spirit of the Tobacco. We grow the Tobacco from seed, and we grow a variety of tobacco, smoking (large leaf), Huichol, Aztec, Hopi (smaller leaf and stronger). We grow this Tabaco for multiple "reasons". One is that the Spirit of the Land and the Spirits of the Munanso appreciate the growing Tabaco, the Spirit appreciates the living plant, not just the dried plant, or the smoke from the dried plant. The Tabaco has a fragrant flower that releases its perfume at night! This is an aspect of the Spirit of the Tabaco that someone who has never experienced the living plant would never know of or realize. The Tabaquero is holistic and embraces the whole process of growing, harvesting, drying and smoking the Tabaco! The plant itself has an energy as it grows that is significant and produces also a super abundance of seeds, tobacco is extremely fertile! The tiny seed easily overwinters in the frozen Earth and snows, sleets and ice, then emerges in abundance through the rains and warm sunshine of the Spring! It is only through growing the Tabaco oneself that the Palero or Taino can truly grasp these powerful attributes of the Spirit of the Tabaco itself! It is one thing to buy a tobacco from a store in the from of loose tobacco or cigar and utilize it in ceremony, but it is a totally different experience when you yourself are experiencing the growth and unfolding of the Tabaco plant itself, when you can walk through the tall tobacco plants, smell their aroma, feel the stickiness of their leaves, and to be able to see first hand the multiple insects that the Tabaco attracts that tell you more stories about the Tabaco! From the miniscule Tabaco seeds, huge plants grow, embodying a phenomenon of how a tiny seed, almost invisible, can become as tall as a person through the magical process of Sun, Rain and Earth! The Tabaquero is intimately involved and connected to these three Misterios which enable the Tabaco to grow, and also the Wind who not only carries the tiny seeds all over to reincarnate again into huge plants, but also provides the oxygen that the FIRE needs to transform the Tobacco into Sacred Smoke! As a night of FROST approaches we gather all the Tabaco plants and pile them up, because once the frost penetrates the Tabaco plants, they will loose their structure and quickly disintegrate into Mother Earth. Yet we do not want to harvest them too early in the Season because we want them to be able to reach their full growth and we want the Spirit to enjoy them as Living Plants as long as possible. This is especially important for those relatives (Ancestors) who enjoyed their Tabaco when in the physical body!!! 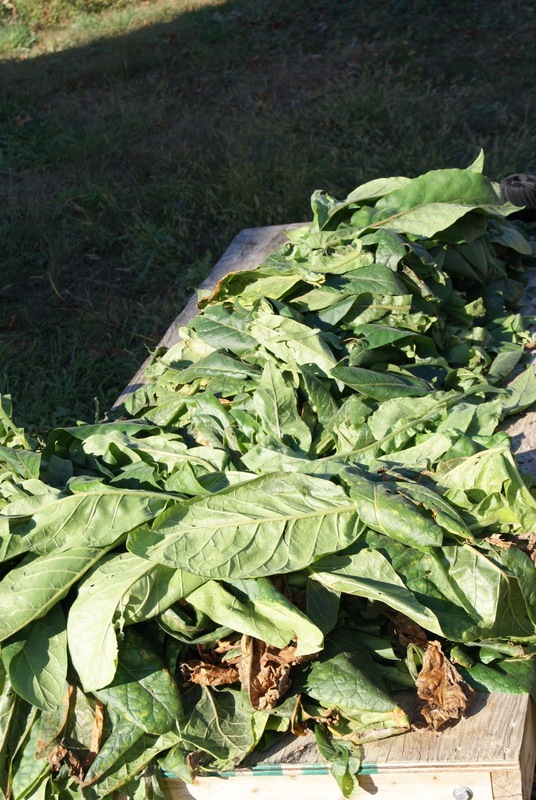 The Tabaco fills up the back of the pick up truck and we bring the Tabaco up to a sunny spot with a large table where we can begin the process of removing the Tabaco leaves from the stalks, saving the dried seed heads and rolling some of the Tabaco up into bundles. We take the small leaves of the Indigenous Varieties of Tabaco (Huichol, Aztec, Hopi) to dry for use in the pipes, as they are the strongest varieties and are Indigenous to this continent! 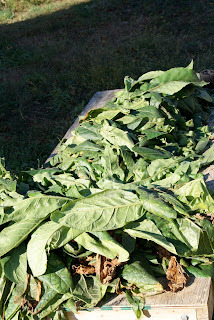 The large leaves of the Smoking Tabaco are dried or rolled up and dried for use within the Munanso/ Bateys, within the Sacred Fire, within Ceremony as direct offerings to the Ancestors and to the Misterios! We remove the leaves from the stalks. Some of the stalks are 2 inches in diameter and very tough! The leaves vary in size and also vary in size year to year depending on the amount of rain we get. This year the leaves were on the small side due to the droughts we had this year. They are still large leaves though! We do wear gloves to handle the Tabaco during this process because as one handles the Tabaco the nicotine within it will leach out and be absorbed by the skin. Too much nicotine can cause sickness, which is also why we do not allow any children to be involved in a hands on way in this process. Once the Tabaco is dried this is no longer a concern. The Tabaco can also be irritating to the skin for people who are very sensitive to it. We roll the Tabaco up into bundles which dry out and are then used, this is also a way to save space because from our relatively small Tabaco garden we harvest a significant amount of Tabaco. If we were to bundle all the Tabaco we would have hundreds of bundles. We bundle some of it and dry the rest in loose leaf form. A full basket of bundles is ready to be taken indoors to where it can dry without direct sunlight or rain. This container is full of growing tips of the Tobacco which were not appropriate for the bundles, it also dries and is used. This box is full of seeds and some dried leaves, the seeds are in the little round seed pods. One seed pod literally contains hundreds of tiny seeds. We save the seed for next year. Even the stalks are saved and utilized for spiritual purposes. We also save the roots. We do not waste any part of the plant and we honor and respect the whole process. As Tabaqueros we understand the Sacredness of this plant and we also understand the abuse of this plant and how the Spirit has rebelled on so many creating much disease! We do not smoke recreationally at all, it is only Ceremonially and bulk of the Tobacco is burned directly for the benefit, strengthening and enriching of the Ancestors!!! Again, we understand that we are blessed to be able to have the space, the Land to grow the Tabaco. We are blessed and grateful to the Misterios who have enable us to manifest "Mundo Nuevo" where we can connect once again to our Roots and to the fullness of our Traditions, and where we expand our understanding of Palo and Taino with the blessings of the Misterios and the Ancestors! Simply awesome. I am so thrilled to see the pictures and read the text. Thank you, thank you. I have learned so very much from you. I bless you for that. You are welcome, you are welcome! My Family and I are truly blessed to have you connected to us spiritually! We return the blessings unto you and yours! MUY INTERESANTE SUS ACOTACIONES.Creo que esta haciendo un trabajo muy bonito.Nzambianpungo le de la posibilidad de continua.Al leer sus comentarios sobre los inquizis y referirsea ellos como MIsterio,me recuerda a mi TAta ,me pregunto si usted tiene consagraciones en Palo Haitiano?